Fundraising - Stained Glass Inc. Put the word out: Put a notice in the bulletin and announce that you are raising funds for stained glass artwork at Sunday School or a weeknight service. People respond with surprising generosity when given the opportunity to leave a lasting legacy in stained glass art. Begin accepting donations from members of your church or parish and others who want to help. Display a fundraising poster and allow people the opportunity to donate. Send in your 25% deposit when you've reached that goal. For the next six to eight weeks, continue your recruitment campaign while your windows are being created. Once you've collected enough to pay the balance owed on your stained glass art, call to schedule delivery. Look for a sponsor willing to pay for your religious stained glass. Your sponsor might be an individual, a family, an organization, or a class willing to donate the stained glass art you need for your religious space. In exchange for their generosity, a small bronze plaque commemorating the donation can be displayed near the stained glass art, or the donors name can appear in the artwork itself. When individuals are given the opportunity to leave a lasting memorial for themselves or a loved one and promote the work of the church, they respond. Purchase one piece of stained glass art and solicit donations to help pay for the rest. Get the first church stained glass windows ordered and installed to allow potential donors to see what they are supporting. Once they see the transformative power of the stained glass art, you'll likely find that your fundraising job will be significantly easier. New pieces of stained glass can be added as funds become available. We have been considering stained glass artwork for our church and we would like your help. If you are interested in sponsoring a stained glass window, then please contact the church office. You can also visit StainedGlassInc.com to see examples of the stained glass artwork. We are forming an Arts and Architecture committee to discuss styles, types and placement of stained glass windows in our church. If you would like to be part of the committee please contact the office. Artist Lyndon Stromberg of Stained Glass Inc. has offered our church stained glass artwork that normally sells for $1,000 per square foot for just $80 per square foot for a limited time. If you are interested in sponsoring a window or in helping us pay for the windows, we would like to hear from you. 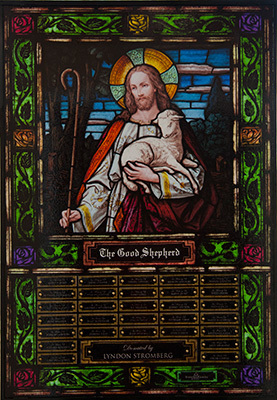 Stained glass memorials are the perfect way to fund stained glass art for your house of worship. These memorials give church members the opportunity to honor loved ones or accomplishments through beautiful stained glass. Stained Glass Inc. memorials consist of a stained glass window featuring memorial plaques. Plaques can be sponsored by families, organizations or individual members of the congregation. When you sponsor a plaque on a stained glass memorial you are not only creating a lasting legacy in your church, but you also are helping make your house of worship a more beautiful, comforting place. 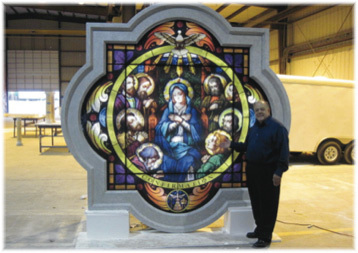 For more information on stained glass memorials call us today! Once the idea was presented to the community we immediately had seven families that wanted to sponsor them. They are all paid in full. We originally intended to only get 4 windows, but when the pastor mentioned the idea in the announcements I was flooded with families wanting to sponsor a window. In two weeks all 24 were paid for.